"Bisquick® and SuperMoist® cake mix make these pancakes sweet, fun and a delicious birthday treat!" Make snack time a sweet celebration! Very good and fun! 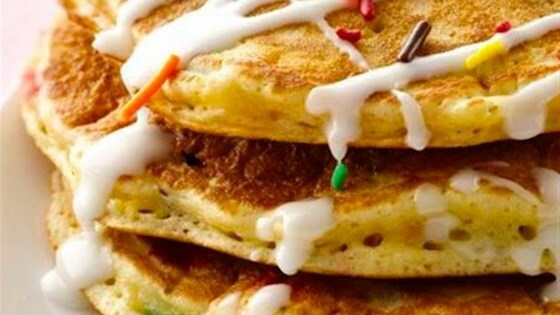 Kids enjoyed these without even having syrup with them! These are incredibly sweet but do make a delicious brunch dessert. My daughter asks for these every year on her birthday. We follow the recipe exactly. Great birthday treat!!! super easy to make. nice and fluffy and delicious. i didn't make the glaze for it (it was sweet enough on its own), but it was perfect with melted butter.